A great, dynamic way to advertise your business or events in busy city centers. 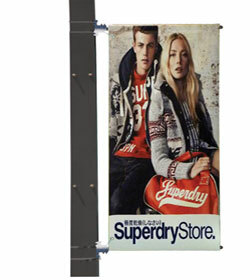 Make the most of all the space available to you and maximize your visibility with our great range of lamp post banners. We have a wide selection of sizes and styles available, all with stunning custom printed graphics at fantastic prices. Prices from £89. An affordable entry level display with all fixings and PVC banner included. Prices from £129. 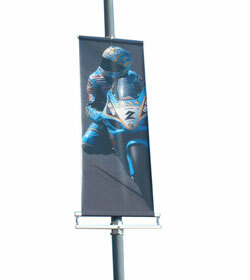 Premium quality display with sprung tension system for taut graphics even in high winds. Prices from £109. Eye-catching, spinning banner. 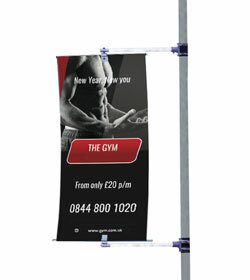 Includes PVC graphics - suitable for 20mph winds. Prices from £1.80 per sign. Super value Correx lamp post sign bundles. Printed in-house for the best results and come ready to fit with pre-drilled holes and fixings. 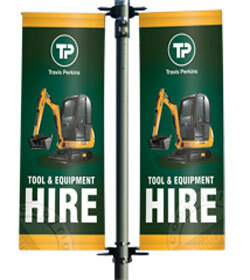 Ideal for temporary event signage or advertising. Looking to update your message or brand without the cost of new hardware? Try our replacement banner graphics service.